There is no longer any good reason to waste any type of water. The technology and financial case for recovering wastewater are already there, says United Nations’ University’s Tamara Avellan. By 2025, absolute water scarcity will be a daily reality for an estimated 1.8 billion people. In a world where vital resources are increasingly scarce, nations cannot afford to flush them down the drain. But that is exactly what we do. After we use water in our homes and businesses, it is washed away, and takes many valuable resources with it. Waste water is rich in carbon and nutrients and – if collected and treated properly – it could provide new water, fertiliser, and energy. A number of nations and major cities have already built sophisticated waste water treatment plants that effectively recover nutrients and bioenergy, and produce “new water” that can be reused. But more than 80 per cent of all waste water still currently flows into natural ecosytems, polluting the environment and taking valuable nutrients and other recoverable materials with it. While wastewater systems in large cities are often effective, they are also very expensive to construct and costly to maintain and operate. This is still better than the situation in smaller cities. There, you frequently find badly adapted systems that lack the necessary staff to perform the needed maintenance and operation. There is no longer any good reason to waste any type of water. Collecting and exploiting wastewater is both technically feasible and financially justifiable. In Latin American countries, those living in small and medium-sized cities have, at most, on-site treatment, in the form of septic tanks that lack regular and proper maintenance. In Guatemala, only about 5 per cent of cities with fewer than 2,000 inhabitants have centralised treatment plants; and in the Atitlan Lake Basin in Guatemala, roughly 12 per cent of the population is not connected to any kind of sanitation system at all. If any infrastructure exists in these areas, its main goal is to collect wastewater, not to treat it and reintroduce it into the water cycle. 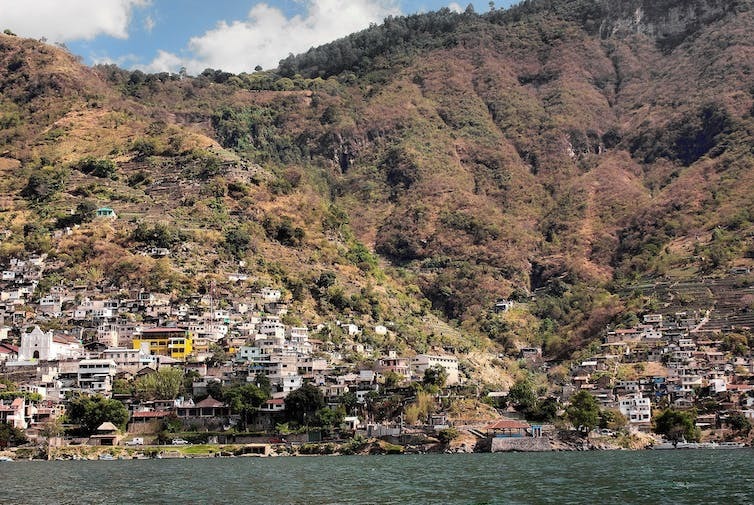 Around 12 per cent of the population of the Atitlan Basin is connected to sanitation. This is even more problematic if we consider that, according to the United Nations Population Fund, the populations of small and medium-sized towns will double in Latin America over the next 15 years and double again in the coming 30 years. And yet, most efforts to improve wastewater management focus on the region’s big cities. Imagine that outside one of these small cities lies a lovely piece of land: on the surface it is aesthetically pleasing and provides refuge for local wildlife. Beneath the surface is a wetland that treats wastewater and produces energy. The energy produced saves families from having to resort to using firewood collected in the wild or manure for cooking purposes. What’s more, the outflow of this wetland can be used safely in crop irrigation. This is not a dream scenario. It is called a “constructed wetland environment” and is already in practice on a small scale worldwide. As part of a team looking into the potential of constructed wetland environments, we have analysed 800 examples of biomass in more than 20 countries. We found that, depending on climate and the type of plant used in the construction of this type of wetland, up to 45 hectares of land could be irrigated using wastewater on a daily basis. This would reduce the need for fresh water for irrigation and energy for pumping. Under this system, a hypothetical community of 60 people would require a wetland area of about 420 square metres. And this wetland could supply the community with 630 kilograms per year of dry biomass, which could go on to produce ten gigajules per year of energy. To put that in perspective, an average household in Ethiopia requires about seven gigajules for cooking and there are about five people per home, so the annual energy requirement for cooking in this community of 12 homes is about 84 gigajules. The biofuel produced by the wetland can therefore supply about 12 per cent of the cooking fuel needs of the village. And by reducing cooking fuel needs by 12 per cent, this village can save half a hectare of forest per year on average. Another solution is constructing decentralised wastewater treatment plants in affected communities. Unlike city wastewater treatment plants, in decentralised plants raw wastewater is treated directly where it is produced instead of being confined in the sewer system. In rural areas, this setup can provide ready access to clean water and reduce environmental pollution. Due to their relatively small size and low carbon footprints, the negative impact these plants have on the environment is lower than traditional plants. Another bonus is that each site can be tailor-made to suit local climatic conditions, aesthetic requirements, water quality demands, and intended use of the water. If properly managed, the water we have already used stops being an environmental hazard and becomes an affordable and sustainable source of energy, nutrients, and other recoverable materials. Tamara Avellán is Research Fellow-Water Resource Management Unit at United Nations University. This article was originally published on The Conversation.